Facebook Chief Operating Officer Sheryl Sandberg offered an update on the social network’s recently introduced premium video ads during the company’s first-quarter earnings call Wednesday. For Sheryl, just wondered if you could give us a little more of an update on premium video ads. Specifically, I’m curious as to how those are sold. Are they sold on an impression basis, or on a performance basis, or some hybrid of the two? On video ads, video represents a really big opportunity, really driven by consumer behavior. Smartphones are going better and faster, and more people have phones that can provide a great video experience. So we’re seeing consumers do a lot more in video. There’s also a lot more video going through News Feed that consumers are putting in, and that creates an opportunity for us, both on the consumer side and the ad side. We have our current product in the market. It’s a click-to-play video ad. It’s part of the page post. You can post the video. Those are sold by both CPM (cost per thousand impressions) and CPC (cost per click), and those are going really well, and I think it explains some of the growth we are seeing in our ads business. We also have been in early conversations with some clients about what would be a CPM auto-play video ad, and in terms of the expectations for that, we really want to see auto-play video ads be something that’s pretty common in the News Feed experience based on consumer usage before we push very hard in the ads business. So we remain, long-term, very excited, but as I said in my remarks, we won’t see a material contribution from it this year. On those auto-play videos, as an average Facebook user, I’ve noticed them more and more in my News Feed, and I think they’re really neat. I think all of my friends love watching videos of my kids play basketball. The question I’d have for you is: What have you seen internally in terms of engagement? I assume that since I’m seeing more, other people are, too, and that users like having them in. But is there any way you could quantify or maybe talk broadly about the impact that’s having on usage? Our goal is to make News Feed as engaging as possible, and I think if you look at the engagement we have on mobile, we’re getting 20 percent of mobile time on Facebook in the U.S. and growing globally, as well. I think you see with that engagement grade, I’m sure your friends love seeing your kids play basketball. I think they probably like to see more of those. And when and if we deliver a really great ad experience and ads that you love, something you’re interested in, I think you’re going to like that just as much. We look forward to the growth. 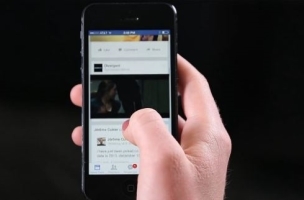 Readers: What have your experiences been with premium video ads on Facebook?